The information session of JSPS was hold at National Organization for Drug Control and Research(NODCAR) in the 4th July w018 2018年7月4日. 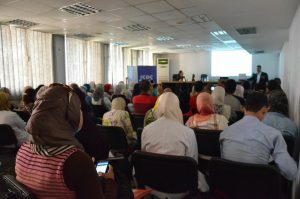 Dr. Fukami, the director of JSPS Cairo research station gave an opening address and Prof. Gad el-Qady, the board member of JSPSAAE explain the JSPS programs and other Japanese ones. 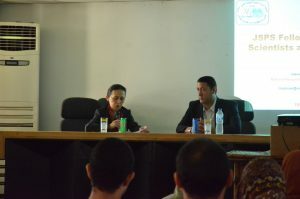 Dr. Neveen Saleh planed this event, and we promised to collaborate. Above 70 researchers were attended and they were not only eager to hear the explanation, but also to question. 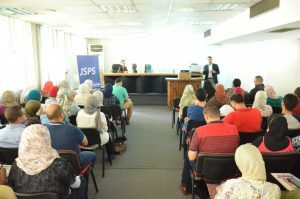 We, JSPS Cairo Research Station will visit anywhere in Egypt that the JSPS explanation is needed for to support scientific research between Egypt and Japan and to promote international scientific corporation.